Cozier than a hotel room. Whether Airbnb is killing hotels is the $25 billion question in hospitality. The latest data point in the debate comes from Goldman Sachs, and it’s not a promising one for hotels: Once you’ve tried Airbnb, there’s a good chance you won’t want to stay in a hotel again. Viewed in isolation, this finding might not give the hotel business serious pause. Airbnb is undeniably big and valuable, but hotels so far have attempted to shrug off its competition by arguing that their services are fundamentally for different people. Hotels are focused on business travelers, who tend to be more reliable and loyal, and to care less about prices. Airbnb has traditionally attracted more vacationers. But as we reported recently, even if that’s true, those leisure travelers are starting to bring Airbnb enough business to have the hotel industry worried. Across the US, the company is estimated to represent just 1% to 2% of hotel demand, but in big cities that figure has crept closer to 6% or 7%. Airbnb, like many of its peers in the “sharing” economy, benefits from scale, or “network effects.” The more people use it, the more they recommend it to their friends, and the faster it grows. And the more people rent out their homes on Airbnb, the more useful and convenient the platform is for people looking for places to stay, and the more valuable the company becomes. What the Goldman Sachs survey implies, then, is that this growing group of Airbnb users isn’t just a growing group of people who happened to find Airbnb convenient one time. Rather, it’s a growing group of people who have become essentially anti-hotel. Hotels might not be concerned first and foremost with leisure travelers, but they surely don’t want to lose them all. 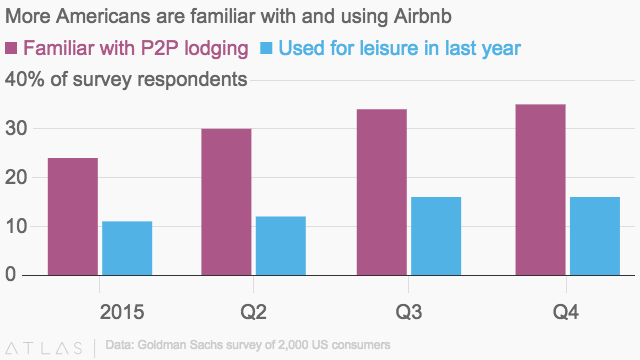 And if Airbnb is as good at converting vacationers as the Goldman survey suggests, hotels might not want to dismiss it so casually.